Water, water everywhere… still got snow you say? Piled high above the window frame? Well – the white stuff, as you know, is water in solid form, and once the weather warms, where the dickens is it all gonna go? So where does the snow go? Snow disappears in two ways, 1. It can melt into liquid form 2. It can go through a process called sublimation; where water in the frozen form changes back to the vapor form without ever becoming liquid. Since the Spring Equinox on March 20th, the Northern Hemisphere tilts more each day toward the sun. The energy generated from the sun’s rays causes sublimation to occur. Sometimes, in the evening when the air cools after a warm sunny day, fog can form in areas that have snow cover. The cool air changes the water vapor into tiny water drops that form a cloud over the snow cover. Click here for an interactive webpage on the watercycle….. However, much of the snowcover will melt into liquid form, some of the water will infiltrate into the ground, but most becomes runoff that enters the watershed. The entire State of Maine drains into the Gulf of Maine. Maine’s land area encloses almost half of the 69,115 square land miles that drain from Nova Scotia to Cape Cod into the Gulf of Maine. Click on the map below. 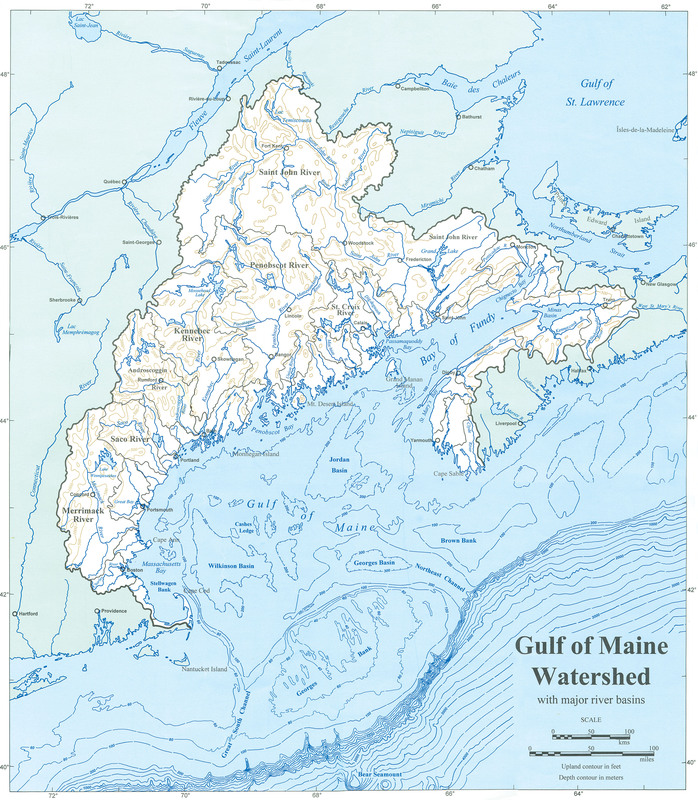 Now, open the Snow Depth Map and compare it with the Gulf of Maine watershed Map. Over half of the State of Maine is still covered in 2 or more feet of snow that will disappear over the next few weeks. If you have the opportunity to observe any brook, stream or river, stop for a moment and think about where that water is draining and what route it will take on its way to the Gulf of Maine. Have you been keeping a journal as I suggested back in Cycles in Nature? Add the snow melt to your observations. Life is persistent and from my observations, as quickly as the snow and ice are gone, life begins anew. Red-winged Blackbirds, Killdeer and Song Sparrow have been reported along the southwest coast of Maine this past week. As the snow melts and the birds fly north, imagine the earth, each day tilting ever-so-slightly, towards the sun with the promise of spring.